In few days, specifically on the 9th of December, the day that commemorates the first anniversary of our friends and comrades abduction; Nazem Hammadi, Wael Hammadeh, Samira Khalil and Razan Zeitounah’s by “unknown” armed groups in Douma. Their whereabouts are still unknown and no credible information about their safety and heath came to light uptill now. We, friends and families of the #Douma4 are launching the second campaign to call for their immediate release only this time we’re releasing number of articles that hold the armed groups in control of Douma and Ghouta responsible for the abduction of the four human rights activists. Attached you can find a translated versions of our statement in English, German, French and Turkish for you to sign and share it with your circles. We managed in our campaign earlier this year with the help of almost 50 human rights organizations to successfully block the funding and support of Zahran Alloush. With your help we can reach maximum pressure on social media. We are happy to receive pictures of you holding signs of the #Douma4 names, short vids from you, audios, blogsports, sit-ins in your city. 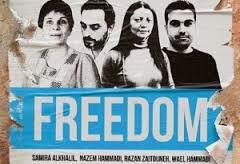 Almost one year has passed since the kidnapping of Samira Al-Khalil, Razan Zaitouneh, Wael Hamadeh, and Nazem Hammadi, a gruesome crime against unarmed activists, and their families who have no information about the fate of their loved ones. This crime is not only ongoing, it is also committed anew everyday with the enforced absence of any information about them. We know today with high degree of certainty the multilateral arrangement that was set up for kidnapping and disappearing the four activists, and we also know a larger number of the names of those who incited that crime, from inside the area and outside the country. And we know with certainty who has all the information about their file, and who used the computers of the four activists. They are partners in the crime by collusion and disguise, in addition to their direct role in the crime of the kidnapping. All the indicators intersect with the group of “Jaish Al-Islam” (Islam Army) and their leaders who have effective authority in Douma. We also know that the crime happened within the context of many other crimes, which reached the limit of assassination in some cases, kidnapping of many, and spreading an atmosphere of terrorism in Eastern Ghouta. And this is happening within a narrow-minded wager, devoid of moral or patriotic content, which consists of grabbing one district of the country and ruling as a fiefdom with the same style of Al-Assad. This approach was not only accompanied by deteriorating military performance against the criminal state of Al-Assad, but also by authoritarian dealings with citizens that combine intimidation and starvation. The hunger spares a commercial-religious-military nexus that consists of merchants who are close to the effective authority, who hoard the food and vital supplies, then sell it at very high prices; fanatic, greedy men of religion; and military leaders who are known to have subordinate relations with regional and international forces. The kidnapping of Razan, Samira, Wael, and Nazem is not an isolated crime of the authoritarian approach, and the crimes contained on its record go beyond what we have mentioned above, and include from kidnapping, assassinating, starving, and dominating all the local populace, but also determination to get rid of any independent voices, just as the Assad regime did in forty-four months of revolution, and forty-four years of its rule. By applying the policy of “no voice can shout louder than the battle’s”, which the Assad regime is specialized in, and with a military record that is like the Ba’ath military record against the Israeli occupation, revolution exploded against Assad’s Junta Regime, and it is the exact same reasons that pushed the local citizens to hunger protests against the new tyrants. Who kidnapped the four activists are partners in the treason against the Syrian People’s struggle for freedom, dignity, and justice. Our demand which hasn’t and will never change is the immediate release of the four activists. We also demand that information be provided about the offenders, so they will not escape punishment for the crime they committed. We also will work on raising pressure on the regional and international powers who coordinate with the effective authority in Douma, to secure the safety and freedom of Samira, Razan, Wael and Nazem. The case of the four kidnapped activists is a political and humanitarian just cause. And we will work with all our strength to make it a global issue. We will continue with our partners in Syria and all around the world, to achieve those demands and to tighten the noose around the necks of the offenders. Posted on December 6, 2014, in Middle East and tagged Douma4, Syria. Bookmark the permalink. Leave a comment.